(work of Billia Antonio 1813 - 1891). 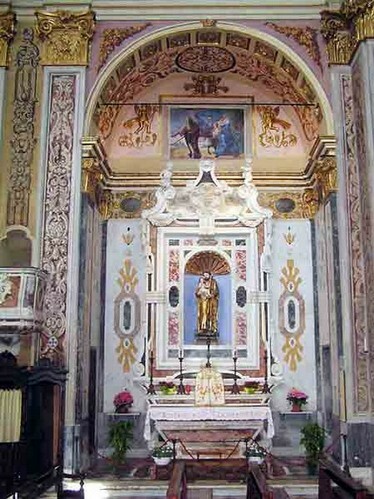 Thus we arrive at the altar, where today the Blessed Sacrament is kept.At the time of the Olivetan monks this altar was dedicated to Santa Francesca Romana, as it was right in front of what was of the Blessed Bernardo Tolomei (where now there is S. Benedetto).Then, for a long time, it was dedicated to St. Joseph. 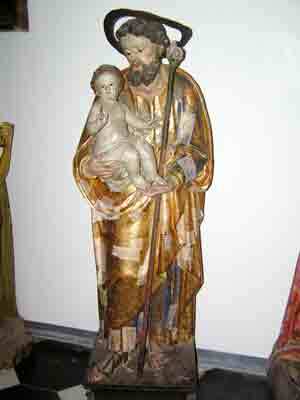 In fact in the painting of the lunette above we see the same Saint Joseph who guides the donkey with Mary and the Child, during the flight to Egypt. 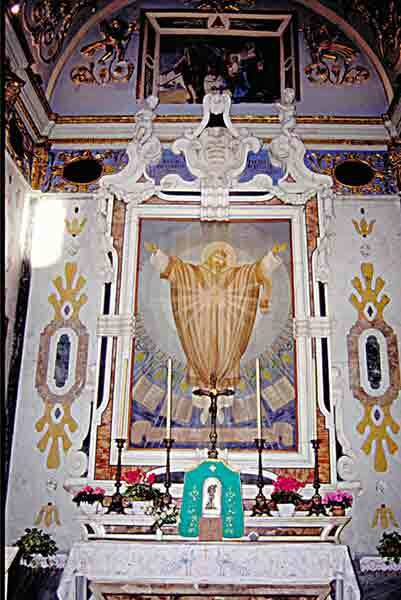 The inscription of the emblem over the altar says: “CONSTITUIT EUM DOMINUM DOMUS SUAE” (God made him the lord of his own house), an obvious reference to the head of the Family of Nazareth.In the 1950s and 60s, this chapel was dedicated to the Sacred Heart of Jesus and our monk / painter Don Leandro Montini (to whom, besides the frescoes of the monastic chapel, a careful restoration of the Marian icon of the high altar of this temple) painted the altarpiece of this altar.NOTE: the altarpiece of the Sacred Heart of Jesus. (Photo below, which can be further enlarged). This previous altarpiece is now, very deteriorated by water infiltrations, hanging above the exit door, which leads from the north corridor of the church into the staircase.